Plastic profiles are produced through a process by which various plastic materials are used to develop quality plastic products. These products have a continuous cross-section such as pipe, drinking straws, decorative molding, eavestroughing, window trimming and many others. The basic procedure of profile extrusion is that the polymer is melted into a hollow mold cavity, under the influence of high pressure. The process for creating plastic profiles begins with the feeding of the plastic material (pellets, granules, flakes or powders) from a hopper into the barrel of the extruder. The material is gradually melted by the mechanical energy generated by turning screws and by heaters arranged along the barrel. The molten polymer is then forced into a die, which shapes the polymer into a shape that hardens during cooling. This process has much in common with plastic injection molding from the point of the extruder technology though it differs in that it is a continuous process. Lomont can fully customize our plastic profiles to your project requirement needs. Some of the plastic extrusions that we can fully customize include tubing, custom profiles and coextrusions. 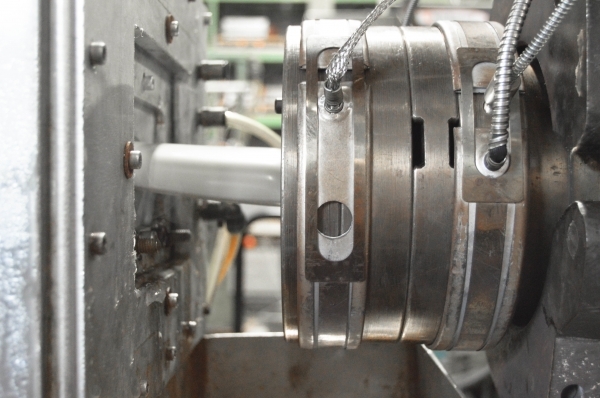 Extruded plastic tubing, such as PVC piping, is manufactured using similar dies as those used in blown film extrusion processes. Positive pressure can be applied to the internal cavities through the pin, or negative pressure can be applied to the outside diameter using a vacuum sizer to ensure correct final dimensions. Additional lumens or holes may be introduced by adding the appropriate inner mandrels to the die. Plastic extrusion tubing applications are noticeably present within the automotive, plumbing, heating and packaging industries. A Coextrusion is the result of the extrusion of multiple layers of material simultaneously. This type of extrusion utilizes two or more extruders to melt and deliver a steady volumetric throughput of different viscous plastics to a single extrusion head (die), which will extrude the materials in the desired form. The layer thicknesses are controlled by the relative speeds and sizes of the individual extruders delivering the materials. Contact us for more information regarding our extruded plastic profiles and plastic extrusion technologies, or request a quote today.